Lonnie Johnson first had the idea for the Super Soaker in 1982. He was working on a model for a heat pump when he attached a homemade nozzle to the end of tubing and connected it to the bathroom sink. A high-powered stream of water shot across the room. It occurred to him the apparatus would make an excellent high-performance water gun. Pictured here are some early prototypes. Always a "tinkerer," Lonnie Johnson, who would go on to invent the Super Soaker, won first place for his robot creation in the statewide Alabama science competition in high school, no small feat for an African American in then-segregated Alabama. The sci-fi TV program "Lost in Space" inspired the creation of the 3-foot tall robot, dubbed "Linex," that took over a year to build. For the young scientist it was the first real step towards a future with NASA… and beyond. After completing his masters degree in nuclear engineering, Johnson went on to a career in government, split between the U.S. Air Force and NASA. Despite his success, Johnson said, "I thought to myself that, you know, I have more to contribute." A more advanced prototype of the Super Soaker is pictured above. In order to build what would become the first commercial Super Soaker, Johnson says he told himself, "Well, you know, what I can do is put the hard-science stuff aside for a minute, do a water gun, make some money on that, and then I can go pursue my other ideas." The Super Soaker hit the stores in 1990 and became an instant hit. Time magazine interviewed Johnson for its December 2000 story covering the best inventions of the year. Super fan Chris Reid has been collecting the water guns for over 20 years. Reid's collection is enough to rival any toy store inventory. Reid said his favorite Super Soaker is the first one he ever had, and he had it autographed by Lonnie Johnson. Super Soakers became hugely popular, spawning various models, colors and styles. Johnson tells a story of how he met his current wife, Linda: he showed her a business card on which had an icon of a water gun. A friend who was with her at the time whispered, "He's an arms dealer!" Chris Reid shows off his Super Soaker collection in all its glory. Here he's laid out each one by model number in the backyard. 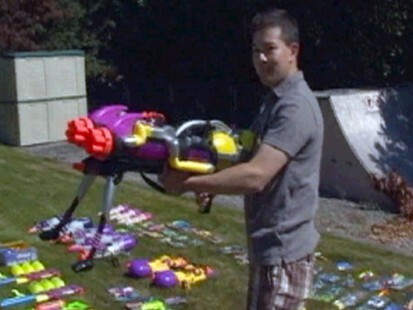 Boeing scientist Chris Reid shows off his incredible water gun collection.